Measuring customer activity in your shopping centre using our advanced people counting systems, enables you to effectively monitor occupancy levels, explore new leasing models and optimise retail spaces but also to maximise shopper engagement and even predict footfall. PFM provides valuable analytics solutions that help shopping centres of any size to boost their sales conversion rate and increase traffic flow. By using our metrics, you can understand the entire customer journey, from the moment they step in to a scheme to the moment they step out, what stores were visited, indoors or outdoors, we have it covered. PFM analysts are committed to making data transparent, understandable and applicable to our client’s needs. Besides day-to-day information on your retail property’s performance, seasonal promotions and events are an effective way to increase footfall in a specific timeframe. But what is the effect on turnover? Or better yet, what is the ROI? Our analysts have profound understanding of marketing activities and the investments involved. In order to measure the success of a specific event, we have developed the PFM Event Monitor, a tool based on the clever usage of footfall data. This tool provides a clear overview of what the expected footfall should be on the day of your event. The actual footfall numbers in relation to the predicted footfall is the basis for the ROI calculation. If we know the average spending of the customers in a specific shopping centre, we can calculate the turnover caused by the event. Also we are able to include data on media value, such as Facebook likes, shares & reactions and clicks on the shopping centre website, so we can tell you exactly what the media value is of a specific event. With the introduction of the PFM Event Monitor we have managed to turn data into value in pounds/euro’s. We can provide a clear overview on costs, turnover of footfall and media value of your event. Spend your marketing budget wisely, get in touch with Ian Muir, Ian.Muir@pfm-intelligence.com. 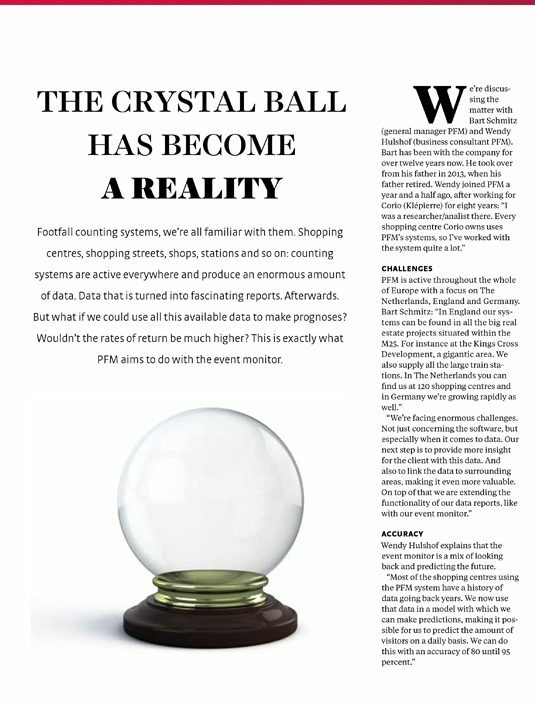 Read the full article on the PFM Event Monitor here. The PFM counting systems provide Leidsche Rijn Centrum with important data on visitor numbers and passenger flows. This data is centrally stored and analysed, which means that management knows very well what is happening in the shopping centre and is able to use the data. In addition, the data is available to the retailers, giving the retailer insight into their own store performance. PFM have supplied Westfield footfall systems for both London and Stratford sites covering all entry exits, zones and internal flow points. The system provides centre management with vital informa- tion on centre performance and flows around the retail space. The size and complexity of each site needed a flexible solution from PFM. PFM are proud to have been providing this service to Westfield since 2008. PFM have been awarded a contract to supply a site-wide footfall system to cover the full 64 acre site gradually over the 5-year build schedule. The site will be divided into distinct Neighbour-hoods and we will deliver footfall data for each of these as well as an overall site total. Additionally we will also provide footfall data for all site retail stores to help Argent manage their performance and attract new retailers to the development.